J.D. Willson and large python. FAYETTEVILLE, Ark. – New research suggests the invasion of the Burmese python in southern Florida could dramatically alter the Florida Everglades’ complex ecosystem. 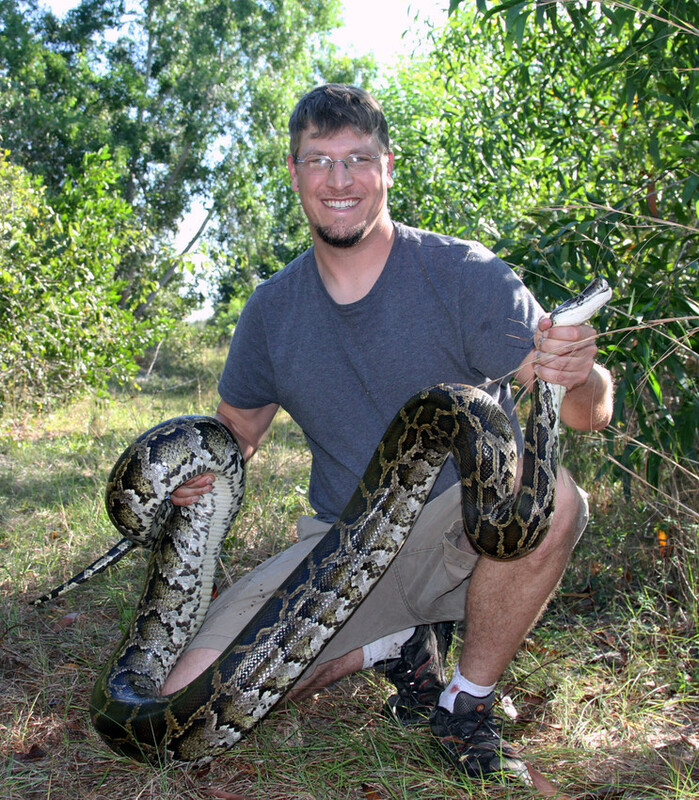 “This is a strong indication Burmese pythons are changing the whole food web of the Everglades,” said University of Arkansas biologist J.D. Willson, who published the findings in the Journal of Applied Ecology. The findings indicate the pythons are feasting on medium-sized mammals that scavenge the nests of egg-laying species such as turtles, causing a cascading effect through the food chain, Willson said. The results also suggest other small egg-laying species in the Everglades could benefit from the python invasion, including ground-nesting songbirds, lizards and some snakes. Willson’s research team created 183 artificial freshwater turtle nests at 13 sites spread over a 7,500-square-mile area and monitored them with wildlife cameras for two weeks. The sites included those where the Burmese pythons have been breeding for more than 15 years, those where the pythons were less common and those where the invasive snakes are not yet established. Researchers found few nest predators and low rates of nest predation in areas where Burmese pythons are more prevalent, while high rates of predation were found in areas not yet invaded by the snakes. Although pythons appear to be having a positive effect on turtle reproduction, other indirect effects could be harmful to native species. The Burmese python — one of the largest snakes in the world and native throughout much of southern and southeastern Asia — has been popular in the American pet trade for decades. Burmese pythons started popping up with increasing frequency in the wild in Everglades National Park starting in the early 2000s.